insects | Live Healthy S.C. The Mosquitoes Are Coming. Be prepared. It’s that time of year when mosquitoes invade South Carolina. Considering the flooding we experienced in October as well as a mild winter and the warm weather ahead, it’s reasonable to expect an influx of these insects in the Palmetto State. South Carolina is home to at least 61 different species of mosquito. While the itch-inducing bite from the pests is enough of a bother, they can pose a real danger in some instances: Mosquitoes in South Carolina might carry West Nile virus, eastern equine encephalitis or other viruses or parasites. Although there has been heightened concern recently over the Zika virus due to an outbreak in South America, there have been no confirmed cases found in South Carolina. DHEC works in partnership with the U.S. Centers for Disease Control and Prevention to monitor mosquito populations for diseases that can be spread to humans. We also provide information to help individuals and communities take action to reduce mosquito populations in their area and prevent bites. Local governments play a key role in protecting citizens from mosquito-borne illnesses either through local mosquito control programs or through local ordinances. DHEC is encouraging local officials to review, update or create local ordinances designed to aid in mosquito reduction or treat standing water from roadside ditches, puddles or pools, and other areas that serve as breeding sites, such as man-made containers like tires, flower pots, kiddy pools, bird baths, etc. Counties or municipalities without abatement programs aimed at controlling mosquitoes are encouraged to institute local ordinances. But local governments are only part of the solution. You must mount your own defense against a mosquito invasion as well. 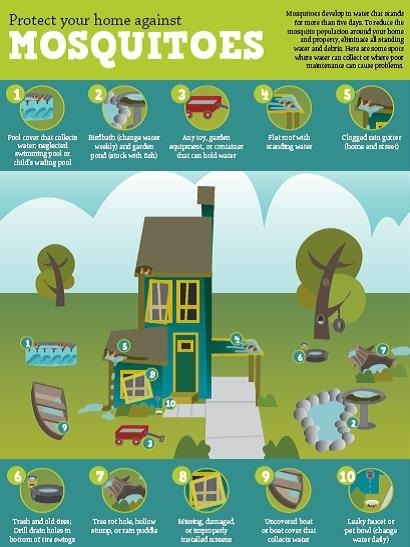 You can begin by removing, emptying or filling any objects in your yard or home that might hold water in order to eliminate breeding sites. It’s critical that we all join forces and do our part to combat the threat of mosquito-borne viruses and parasites. We must be vigilant about controlling the mosquito population in our own yards and communities while protecting ourselves from bites. Clear out weeds, leaves, dirt and other debris from pipes. Clean out rain gutters and downspouts regularly. Empty and turn over containers that hold water, such as cans, jars, drums, bottles, flower pots, buckets, children’s toys, wheel barrows, old appliances, plastic sheeting or tarps used to cover objects like grills or swimming pools, etc. Make sure that all permanent water containers, such as wells, septic tanks, cisterns, water tanks, and cesspools are tightly covered and insect-proof. Change the water in bird baths and empty and clean out children’s wading pools at least once a week. Clean out and change the water in your pet’s water bowl or trough every day. Larger troughs for livestock should be cleaned out on a weekly basis. Cover trash containers and garbage cans to keep rainwater from accumulating. Drain or get rid of old tires by recycling them. We also must protect ourselves from mosquito bites. If you must be outside, apply a mosquito repellent — either a spray or wipe — to your skin or wear protective clothing per manufacturer instructions to help shield you. Avoid going outside at dusk or wearing perfume or scented products. Also, keep car windows rolled up and garage doors closed at night. Please also make sure that all screens on windows and doors are intact and installed properly. Make no mistake. The mosquitoes are coming. Be prepared. Visit DHEC’s mosquito information page for additional information about protecting yourself from mosquito bites, eliminating breeding areas, local mosquito control and more. This entry was posted in Community Health and tagged DHEC, insects, mosquito control, mosquitoes, South Carolina, Zika on March 17, 2016 by SC DHEC. Recent rains and flooding left many areas of South Carolina saturated with standing water, which has the potential to become breeding grounds for mosquitoes. Mosquitoes are cold-blooded and do not thrive in cooler temperatures, so cold snaps in the weather can help reduce the likelihood of excessive mosquito breeding. But don’t just count on the weather. You can do your part to reduce mosquito populations and reduce your family’s exposure to these pesky, and potentially harmful, insects. Do your part – reduce mosquito breeding habitats. If you choose to wear insect repellent, the EPA has a web-based tool to help you find the proper insect repellent for your time spent outdoors. If you have mosquito problems in your area, please visit DHEC’s mosquito information page and click on “Local Mosquito Control” for a list of local mosquito control agency contacts. Download our helpful information sheet on protecting your home against mosquitoes. This entry was posted in Disease Control, Emergency Preparedness and tagged #SCFlood, bug bites, floods, insects, mosquitoes, West Nile on October 23, 2015 by SC DHEC.